Ahhh, October. My favorite month, wrapped in the cozy blankie of my favorite season. 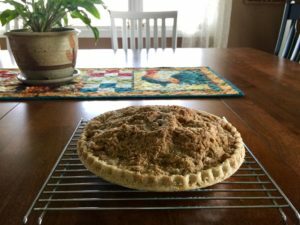 Crisp air, blue skies, fire-shaded leaves, harvest, apple pies. Lots to love. What I like about this one is that Ms. Doyle tells the tale in a rhythmic-but-straightforward, kid-friendly way, moving us from one chore to the next. Yet she sneaks in so many lovely, lyrical turns of phrase. She calls what the family is doing “putting the farm to bed.” When they shake straw over their large strawberry patch (the family has a roadside stand, as does Ms. Doyle), they “blanket them from winter’s frosty bite.” And they don’t just cover tender plants in the hoophouse, they “float sheets of white cloth over the baby greens…” It’s all so evocative, and it isn’t just because I live on a farm myself that it warmed me from the inside. Repeated throughout is the child narrator’s refrain that bids good night to the plants, the fields, the hoophouse, the bees, etc., as each is prepared to withstand winter. This is illustrator Becca Stadtlander’s second picture book. The first is On the Wing, by David Elliott (Candlewick, 2014), which I’m going to have to find. She is really impressive and obviously a star on the rise. I can’t wait to see what she does next. 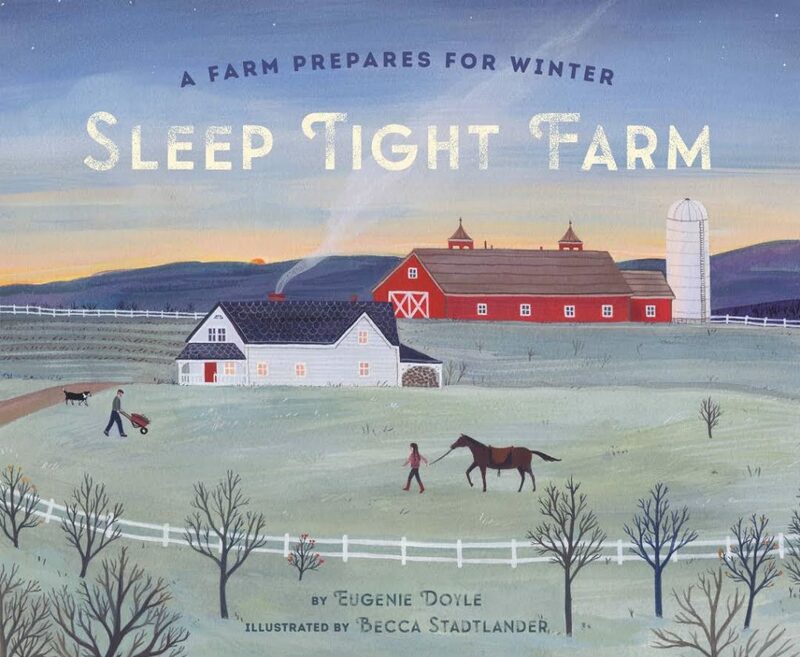 Sleep Tight Farm is set in the present day, but Stadtlander’s richly-detailed paintings have a soft, nostalgic feel that make you want to curl up beside a cozy fire and sink into them. See? I mean, that cat in the window. The eggs in the boy’s basket. A Mom wielding a hammer. Love that (and her knee pad!). All in all, this is a beautiful book you’ll want to share with the kiddos you love. I know I’m going to buy a few for gifts, because mine has earned a permanent place on my bookshelves. 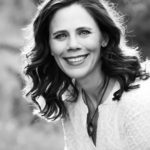 Websites: Author/farmer Eugenie Doyle. Illustrator Becca Stadtlander. Becca Stadtlander, chronicle books, Eugenie Doyle, farm stories, Jill Esbaum, Sleep Tight Farm. Bookmark. Jill, Thanks for this one. We live in a place where farmers do these very things. Love the illustrations of this one too! And, I can smell that pie over here as I sip my coffee and look out at fall’s changing landscape. Ahhhh. Those end papers are perfection. Wish I could s-t-r-e-t-c-h this month into, like, six weeks. I love autumn! I keep hearing about this book everywhere too, Jill. Thanks for sharing this! I hadn’t yet heard of it, Maria! Good to know word’s getting out. I agree – this is a lovely book, with such lyrical language & pastoral scenes. Great review! Thanks for sharing this beautiful work of art with us! Thank you, Jill! I have both Sleep Tight Farm and On The Wing on order now. Can’t wait to curl up with a pumpkin spice latte and read them. Wish I had your pie skills…looks delicious!! Beautiful! Thanks for sharing, Jill. And your pie looks scrumptious. Wow! I haven’t heard of this book but am dying to get my own copy. I now live in the suburbs but grew up on a Wisconsin dairy farm. . . . I can’t wait to see this book. I’m a sucker for crumb topping, Andy. Yum. Thank you for bringing this book to our attention! I can’t wait to read it! The art details along with the story look to good to miss! It IS exactly that, Kim. Too good to miss! I love this book, too! Fall and winter are my favorite seasons, and I just love how the story and illustrations lead from one to the next. Cozy! Ha, Kathy. You’ll love kicking back and relaxing with this gem. Well the book looks gorgeous, and that pie looks delicious. Yum! So gorgeous. We can only hope our stories find illustrators that take a book so deeply into their own hearts, Linda. Thank you for sharing your book discovery, Jill, while you attended the Sheboygan Children’s Book Festival. I look forward to reading SLEEP TIGHT FARM. Honestly, Suzy, I was a bit panicked over the weekend. This post was sneaking up on me, and I hadn’t yet decided what to review. This one found me. Serendipity. A picture book perfect to cuddle up to on a winter’s night! Thanks for sharing! It is! Kids will love it, I think, Kathy. Wonderful! I can feel winter coming, and I can smell your apple pie! I agree that October is one of the easier months to appreciate. Cooler weather and bountiful harvest. Fingers crossed those cooler days hang around awhile, Cassie! I know a few farm kiddos who need this book, including myself. 🙂 Love it. Would be pleasantly educational for town kids, too. But, yeah, farm kids would recognize themselves here, Lindsay! A visual treat and love how women are depicted on the working farm! Me, too, Kathryn. Real Life. So lovely! Can’t wait to seek this one out. Love the crisp, frosty color palette on the cover. Thanks, Jill! Well done, Jill! Beautiful book, beautiful pie! !